Aotwa(AOTWA) SCE series of screw coaxial heat exchangers are designed for small and medium-sized cold and hot water units to produce chiller and/or hot water for air conditioners. The refrigerant applicable is R22. The series consists of 24 models, with refrigerating capacity ranging from 5 kW to 125 kW. For their unique features, screw coaxial heat exchangers are widely used in air-cooled chiller and hot water units, watershed heat pumps, water circulation heating pumps etc. The heat exchanging tubes are tube bundles with riffled tube and outer tubes are seamless steel tubes covered with thermal insulation materials. The refrigerant evaporates through forced convection in the heat exchanging tubes and cools the tube walls. The circulating water flows outside the tube bundles and heats the tube walls through forced convection. The two medium exchanges heat via walls of the heat exchanging tubes. In established utilization scope, flows on both sides of the tube walls are vigorous turbulent flows. The heat exchanging tube bundles are symmetrically distributed into a helical structure of specific thread intervals. Such a structure enables the tube pass length, serviceable conditions, reliability, and heat-exchanging boundary situations of all tubes are the same. In addition, under the co-function of helical tubes and the inner threads, secondary circulation flows in vertical direction to the main flow are formed in the tubes. Complicated irregular channels with helical features are formed in the intervals between the helical tube bundles and outer tube cases. As a result, powerful secondary circulating flows are formed from the circulation water. The secondary circulation flows on both sides prominently strengthen the heat exchanging effects. 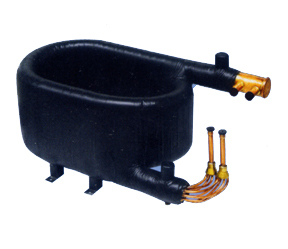 Liquid distributors are installed in the refrigerant inlet to ensure that the flow supply to each tube pass is even and uniform, so as to make full use of the heat exchanging surface. The SCE series of screw coaxial heat exchangers have been designed on the basis of summarizing the existing domestic and overseas designing experiences and after lots of simulation calculations and dissection experiments. The designs are comprehensively optimized, the structure is more rational, and the performances are even better. Quality copper tubes with riffled threads and low ribs up to GB/T8890-1998 are chosen as heat exchanging tubes. As for the outer casing tubes, quality seamless liquid tubes with smooth inner walls, up to GB/T8163-1987 are chosen and processed with hot galvanizing techniques. Compared with weld steel tubes, seamless tubes do not involve the risk of welding seam breaking from the vibrations and pressure impacts during long period of operations and the risks of the copper tubes' being punctured by burrs on the inner walls of the seams. Therefore, its long-term service is highly reliable. In the practical operations of refrigeration systems, influenced by temperature fluctuations, circulation starting and stopping, the heating pumps' defrosting, and expansion valve adjustments, the internal pressure is always under frequent alterations. Under high or frequently changing pressure, plate heat exchangers are liable to deform, fatigue, and be damaged. But coaxial round pipe structure is much more capable in terms of high pressure and impact resistance. Therefore, screw coaxial heat exchangers can better suit the complicated practical operation situations of refrigeration systems. As screw coaxial heat exchangers' side water flow passages are of large sections and facilitate the passing of large fibers and sands in the water, the passages are unlikely to be clogged. For the same reason, scale deposits forming on the tube walls from hard water are unlikely to cause clogs. Therefore, screw coaxial heat exchangers have strong water quality permission range. There is no upright ascending passage in the refrigerant flowing process of screw coaxial heat exchangers and even if the flow is small, the lubricant can surely return to the compressor. It is unnecessary to worry about such risks as reduction in heat exchanging area, passage clogging, instability in operation, and damages to the compressor because of lubricant blocking in the evaporators. During the manufacturing process of screw coaxial heat exchangers, it is only necessary to connect a few places at the entrances and exits of tubes and the connecting techniques are far simpler and easier than those on other heat exchangers. It is easy to guarantee the connecting quality and control the risks of leakage at connecting points from long term of vibrations, fluctuating pressure, and temperature alterations. screw coaxial heat exchangers have unique advantages in terms of structure flexibility because the outer tubes can almost be processed into any shape according to the users' needs and so are the locations and directions of outlet and inlet tubes. Although the tubes may occupy a large area, as they are hollow inside, other parts of the system can be placed here. Besides, at more and more occasions, the users request the heights of heat exchangers be lowered as much as possible and screw coaxial heat exchangers can perfectly meet the users' designing requests. As it is unnecessary to use a lot of such expensive metal as stainless steel and aluminum and complicated manufacturing techniques, the users are able to purchase heat exchangers of the same capacity at lower prices and the manufacturing costs of whole units can be effectively decreased. Additionally, as screw coaxial heat exchangers wear well, they can help the whole unit manufacturers save large amount of after-sales service expenses. According to the clients' requests, this product can be built into heat exchangers of single water circuit, two freon circuits, or multiple freon circuits to satisfy the requirements of multiple system mainframes, perform energy adjustment, and meet the society's current needs for energy saving. 1. Before leaving factory，this product is full of high pressure lndustry Nitrogen. Please set it free from danger. 2. Please don't fill the water into the front water path before filling the Fl in case bear down copper. 4. Please let the water our of the heat exchanger in case you leave it unused for a long time. 5. To guarantee the good heat insulation effect,don't make the exterior temperature preservation wet. 6. Please keep the flame out from the temperature preservation in welding. 7. The two-way Freon circuit shall be in layout of inner-to-inner,outer-to-outer. 8. Before the installation,the nitrogen remained inside the inner circuit shall be released, then the outer circuit. 9. Freon shall be charged outside first,then inside or added simultaneously. 10. When you install the units,you must fix auto exhaust valve to be exhaust smoothly and use safely if the water pipe of inlet water circult has protruding zone.